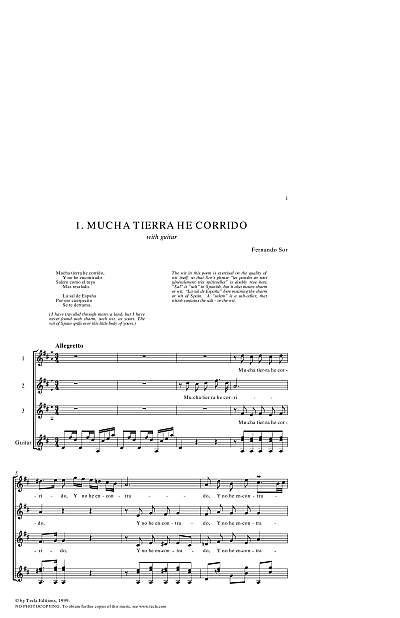 Sixteen songs by Sor in Spanish for two or three voices with guitar or piano accompaniment, all of them now published for the first time in our own age. 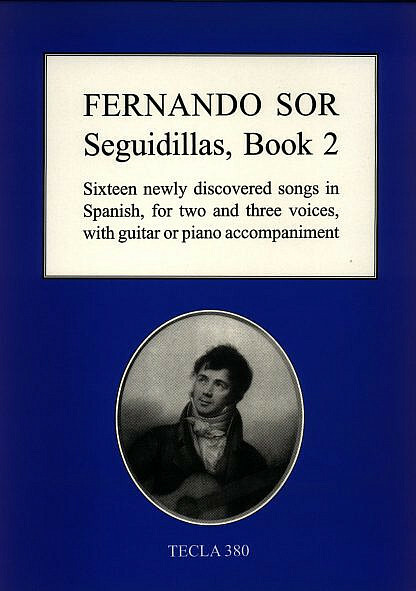 Sor’s Seguidillas Book 2 is a further collection, following on from the Tecla edition of Sor’s Seguidillas, but this time for two or three voices with guitar or piano accompaniment. Sor’s songs in Spanish in the seguidillas boleras form are a very special contribution to Spanish musical culture. They were composed within that great age of creative art, music, dance and popular literature which occurred in Spain at the end of the eighteenth and beginning of the nineteenth centuries. Utterly Spanish in their words, their wit, their intensely alive musical idiom and their indigenous dance form the bolero, they shine for us still today. In 1976 I published twelve of them under the title of Sor’s Seguidillas, which have been widely performed since then. Those twelve were all for solo voice, some with guitar accompaniment and some with piano. Now here is Sor’s Seguidillas Book 2 which is a further collection, this time for two or three voices with guitar or piano, all of them also now published for the first time in our own age, and some of them indeed now newly discovered and identified. There are 52 pages of music, with an introduction and notes by Brian Jeffery. 80 pages. 12 x 9 inches. 1999 (as “More Seguidillas”), reprinted 2005. As well as the introduction, also included is an English prose translation of all the Spanish texts. “Los canónigos madre” (at 10’21”) for two voices and piano or guitar. Facsimile of “Me preguntó mi amigo”, in Sor’s autograph. At the Darwin Guitar Festival 1999 we gave what was probably the first modern performance of the first four songs. It turned out that they are very fine, some of them real Three Tenors stuff. Since then they have been performed at the New York Festival of Song and elsewhere. These songs will interest singers looking for new repertory, especially if they are looking for new Hispanic material. If you know singers who might like them, do please tell them. “This is a fine publication: attractive but unknown music is presented with all the information that one needs” (Early Music Review, February 2000). “L’invenzione melodica è ricca di fascino” (“the melodic invention is rich in fascination”) (Guitart, April/June 2000).